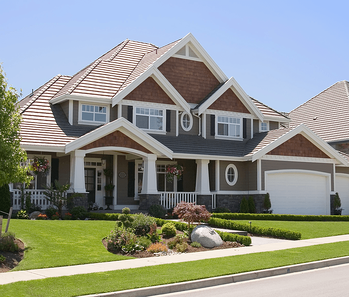 Your home builder website needs optimal SEO. SEO, as you probably know, stands for Search Engine Optimization and it's the overall term for various methods used to ensure the visibility of your website and its content on the search engine results pages (SERPs) when people are looking for a new home in your city. In the world of SEO practices, there are those that are considered 'white hat', and those that are deemed 'black hat'. Black hat practices are often those that seem like an easy win in drawing traffic to your site, but are usually done by shady means that Google will eventually penalize. And you don't want to be penalized by Google. The good news is there are many 'white hat' methods for getting great results with your SEO optimization. When building a new home builder website, you'll want to consider SEO factors from the start of development. When you have a straightforward site that has clear navigation, search engines can index your site with ease. If the user experience is a positive one, your visitors will be more likely to return to your site too. And this is something Google notices. Search engines draw a huge amount of traffic to websites. With solid SEO in place, your website is going to get noticed and you'll get increased organic traffic. Below is a checklist of questions you'll want to consider for optimizing your home builder website. When someone is doing a search, they usually ask questions or type in phrases that use very specific terms. It might be a simple question or it could be one more complicated. For instance, "Who is the best home builder in Edmonton?" or "Home builders that do infill." From these, the search engines will try to provide the most relevant results. They find these results based, to some degree, on algorithms. But there are factors that will influence these results. And they all have to do with relevancy - such as the searcher’s location, the time of day or year, etc. So, take that into account when planning your SEO strategy. 2. What is the Quality of Your Content? Start paying attention to what you're putting on your website when it comes to your content marketing strategy. Are you publishing articles that are helpful? How about videos or other media that are informative? What is the quality of these writings and productions? Remember, you're writing for actual human beings, not the search engine. Incorporate longer-form content that speaks to the visitor, rather than focusing on keywords based on popular search queries. Google frowns upon finding two identical pieces of content. It doesn't matter if it's on your own site or another. It's only going to turn up one of those pages during a search. Keep an eye out for scraper sites that steal your content and then try to publish it as their own. 3. 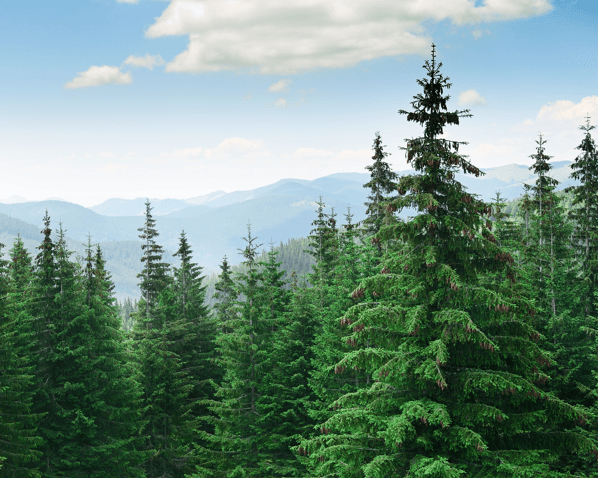 Is Your Content Evergreen? You've seen the sites with flashy news stories and all sorts of headlines that try to entice you. They draw a quick burst of traffic, but there's not a lot of holding power there. You want your home builder website to be a place with evergreen content where people can find practical and advice-based articles as well as market-relevant pieces or features that stand the test of time. Content they can revisit or refer back to when needed. This is the sort of content that also sits in those higher spots on the search engine results pages. A side note here: that doesn't mean you shouldn't ever post content that isn't evergreen. Time-sensitive pieces can give your credibility a boost and hopefully bring visitors back to your site to check out what else you can offer. 4. Do You Come Across as an Authority in Your Field? Do you know of a website in the home building industry to which you always refer? If so, that is an authority website. It's one that's respected by its users, the industry it operates in, other websites, and search engines. If you can get a link from an authority website, it helps your visitors feel more confident about your abilities. Pair these with the valuable content we talked about above and you can eventually become an authority website too. 5. Did You Include Meta Descriptions and Title Tags? 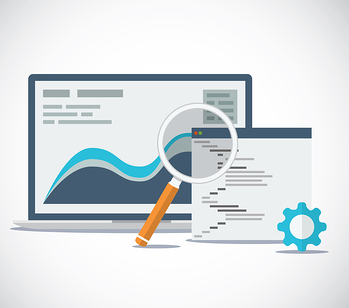 A meta description is a very short paragraph of text (usually between 150-160 characters) that appears in the search results under your page’s URL. It needs to be relevant to the headline of the article, as well as to the content. Before you hit the publish button on that new article, you want to make sure you've filled out your meta description. A well-written description will help increase your chances of a searcher clicking on your result. It's not meant to place you higher on the search engine result page, it is designed to get the click. 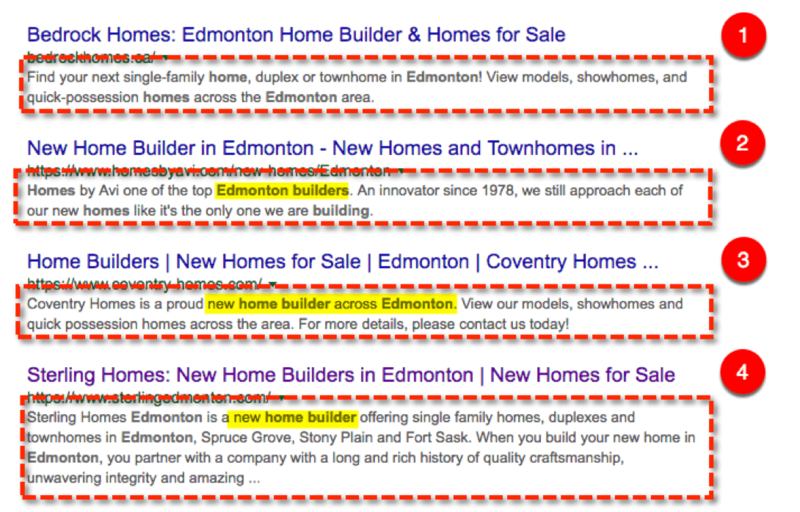 For this example, the search term was "Edmonton home builder." 1. This description doesn't have the keyword term in one sentence. It should also be a little bit longer. 2. The full search term wasn't included, it could be a lot more inviting, and the title is too long and has been cut off. 3. Another example without the full search term and there's not much incentive for the searcher to click. Again, the title is too long and had been cut off. 4. The title fits on this one, but the description is too long and doesn't include the full search term. Note: having variations of popular keyword searches is recommended, but none of these examples included the actual search term. Title tags are used to tell both the search engines and potential visitors what your site is about in the form of a short and concise title. Try to use a few accurate keywords describing the page, and include your brand name. However, you want to make sure you only use relevant keywords. And once again, keep in mind that even though you're doing this for search engines, you are still writing to humans. 6. What's Your Site Speed and Cross-device Compatibility Like? Search engines pay attention to how quickly your website loads. Slow is a no-go these days. Searchers are way too impatient for that. Also, you want to be sure that your content is optimized for any screen size - be it a phone, a laptop or a tablet. Google recommends responsive design as the preferred method of mobile optimization so consider that when you set out to design your website. 7. What's the User Experience? It can't be emphasized enough that there are a lot of SEO benefits that come from providing the best possible user experience. 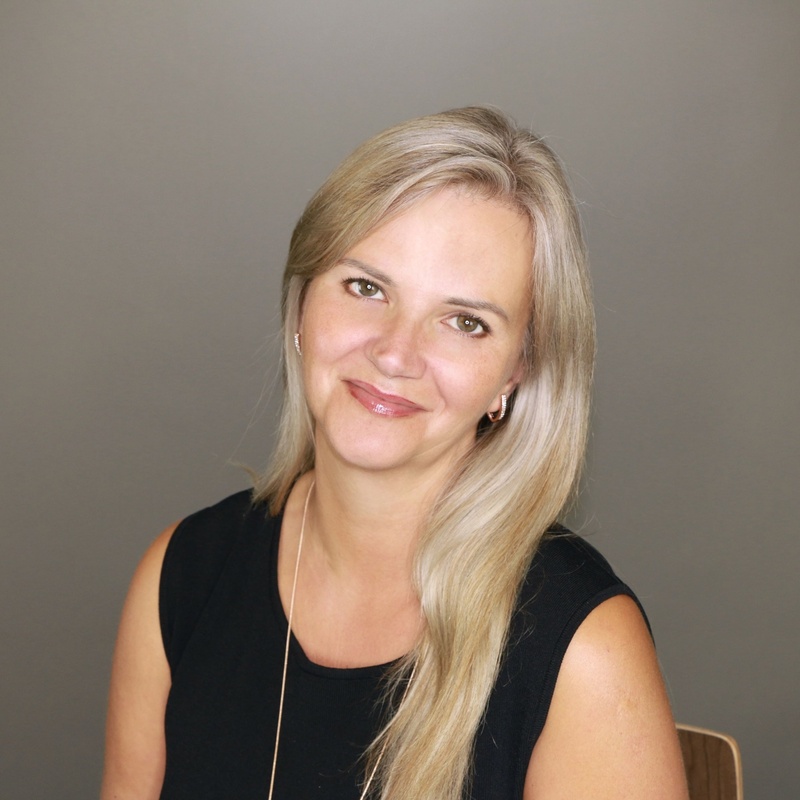 To keep your visitors on your web page and wanting to explore further, be sure your site is easy to navigate, clearly searchable and has relevant content with internal linking. 8. 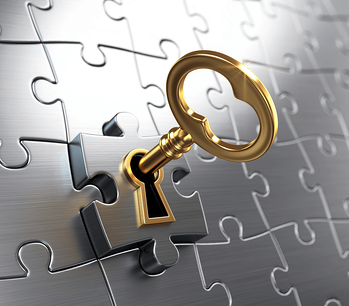 Are You Using Internal Linking? Internal linking is a practice that article writers and editors use to help push traffic around the site. 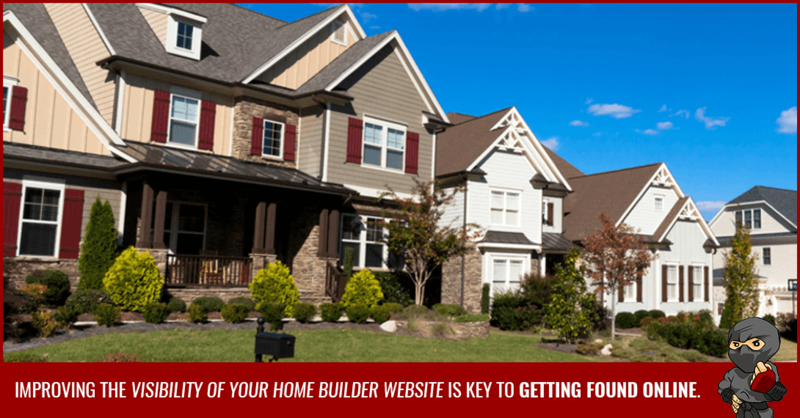 As a home builder, you want to send signals to search engines that your site is a trustworthy one. give your audience further reading options and reduce your bounce rates. improve your ranking for certain keywords. make it easier for Google to crawl and index your site. Although internal linking is not weighed as heavily as it once was, it is still an important part of SEO. 9. Do You Use the Alt Text to Tag/Describe Your Images? When you upload those impressive images of your showhomes and communities to your website, don't forget to include the alt text! In other words, describe what's in the image as accurately as possible. You need to do this because Google is not capable of 'seeing' your images, but it can read the alt text. By describing the image, you increase the chances of your images appearing in a Google Image search - a big plus when you're hoping to have your homes showcased in a search. 10. Are You Taking Advantage of Your Headlines and Permalinks? Headlines for your articles should be eye-catching and should be no longer than 55 characters. This gives them increased visibility in search engine result pages and keeps your title from being cut off. And for the love of all things marketing... Avoid. Clickbait. Headlines. Never promise something your content can't deliver. Meanwhile, the permalink - AKA the URL - for the article doesn’t have to match the headline exactly, but it should include important keywords, and you can drop stop words to keep it clean. 11. Do You Use Social Media as a Means for SEO? On the non-technical side, social media marketing is one of the easier ways to increase your SEO. You need to be present on all relevant social channels in your industry. And beyond. This is going to raise your site's visibility. But remember that you're not just broadcasting your content. Social media allows you to use it as a customer service channel. It's a way to show that your company is friendly, helpful and maybe even entertaining. You know, like Wendy's on Twitter. 12. 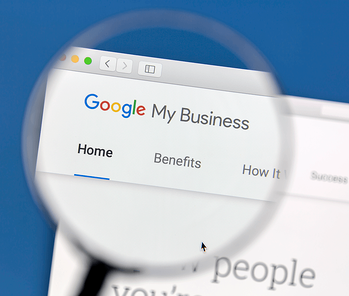 Have You Registered With Google My Business to Take Advantage of Local SEO? More and more, Google creates results based on the location of the searcher. This is especially important to you - as a home builder, you're likely to have a relatively local scope. 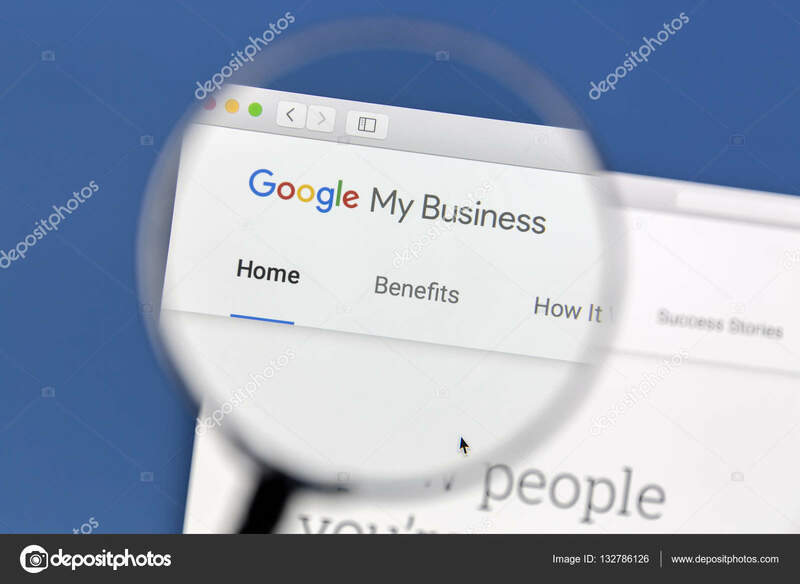 Register with Google My Business and check to see that all of your information (opening/closing times, contact information, customer reviews, etc.) is accurate and up-to-date. 13. Is Your Comments System On and Do You Engage Commenters? Yeah, there can be some opinionated people out there. And you may not always want to hear what they have to say. But this isn't a reason to turn off your comments system. Having an active community of people who regularly comment and engage in dialogue under your posts shows that visitors care. Even if that care shows up as praise or severe criticism. Whatever the case, people are reading your content. You have to stay on it though. Filter out spam comments or remove any that slip through as soon as possible. And make sure to respond promptly to questions. If someone comments on your post about the featured show home of the month, don't ignore them! As you can see, SEO is very important in helping your home builder website rank high in the search engines. Even though it might seem like a lot to remember, once you get in the habit of optimizing your site, you'll see the payoff is more than worth it. Do you have any other advice for optimizing SEO while creating a home builder website? Feel free to contribute!